Can not play on other region clusters. Need help from support. I am a NA player but decided to create an account on the EU side to see how the player base is different and for the experience. - Decided to make an EU planes account to see how the player base is different from NA. - Created a brand new email to attach my EU account too. 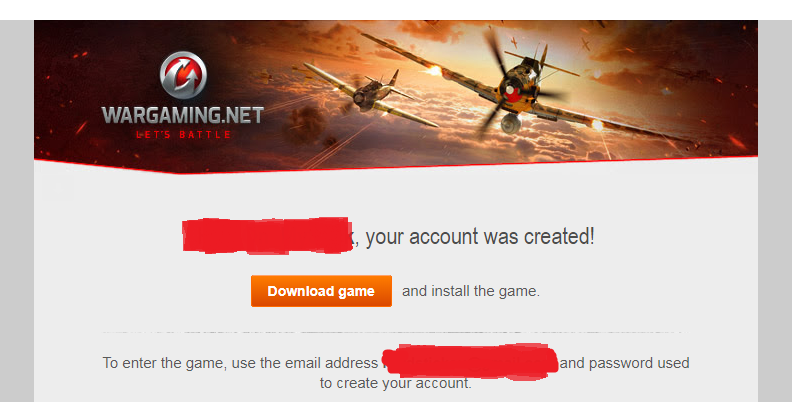 - Registered a new account on the WoWP EU website with new email. - Activated game registration that was sent to my new email that was set up for EU account. - Downloaded EU client to my game centre. - EU client selected in game centre. - EU cluster game login screen appears. - EU email and password for account entered and error stating incorrect email/password. - Attempt to troubleshoot by resetting password and error stating an account that I activated in an email from wargaming does not exist. This is the second brand new email I have set up in an attempt to create an EU account. Same error for both attempts. Try to login to the EU game webpage and same error comes up. Can not login to EU support to get help from them. Opened a ticket in NA support and got a very fast reply stating they don't do anything and to contact EU support. Was told about the anonymous ticket and that it would be my best way to contact EU support, I get through most of the anonymous ticket and just before the end it asks for an account that is associated with the problem and I can not get any further because it is a mandatory field and the account I want fixed is coming up an invalid. Below is a screencap from the email where I activated my account. I edited the account information for my security but I am entering exactly as what I set up and it is not working. Maybe try bypassing the Game Center when you log into EU client. Clear your browser cache then try logging into EU website. * Another note - In the previous version of the game some people had problems when they had both NA & EU clients on the same drive. Edited by Perco_lator, 15 January 2018 - 07:57 PM. OK, will try this. I have tried to login from the application but not clearing my cache. Also will trouble shoot with the drives as currently both applications are on same drive. Hope one of these work. Thanks. Not sure if the multi client mod works for 2.0. But that's one way to play on EU without installing another client. One thing that I can think of an issue that may be obvious to most people, is running the correct exe file for wowp. Because the wowp client doesn't distinguish between regions (ie Worldofwarplanes_NA.exe or Worldofwarplanes_EU. Exe). Instead you get the exact same file names (Worldofwarplanes.exe) for the executable. So just double check in your file path wherever wowp eu is installed and directly run it from there. Avoid using shortcuts or the WG center. That thing is a mess and is only useful for updates/downloads. I can't really think of any other solutions. I've never had a hiccup when running wowp in eu or ru while having NA installed. So not sure why it's not working on your end. I would double check that account on the wowp eu portal (check the url includes EU not NA) see if you can login with the new email. If so then there shouldn't be any issues on the EU login server. If not just make another new email (i recommend gmail - easy to setup) and follow the suggestion above. Also with the registration, I've got away with just using the same email for different regions. Good luck in solving this issue! Edited by ArrowZ_, 15 January 2018 - 11:56 PM. After a fresh install on a different drive and starting the application from the WoWP EU folder the login screen came up. Tried to login with no success. Decided to troubleshoot and register another account. Made another email and started the registration. I only figured this out after checking my address bar and scrolling to the end to see that it was a NA registration. You didn't clear your browser cache/cookies & that is why it will auto send you to the NA login page when you try to register on the EU website. Pretty sure the multi region mod does not work in 2.0. I have not tested it, playing on EU/RU just doesnt blow my skirt up.